Sagehen startups make that risky, rewarding move into the real world. For the young and entrepreneurial, launching a startup with your college friends is a natural thing to do. You’ve spent countless hours studying, hanging out and crafting ideas together in an environment that is ready-made for inspiration. Pomona College is in the midst of a mini-surge of Sagehen startups, part of an entrepreneurial scene that reaches from the Bay Area to New York and beyond. Lately, Southern California, too, has seen a wave of new ventures in areas such as tech, with dozens of incubators and accelerator programs launching, and venture capitalists taking notice and investing in promising young companies. Right here on campus, business-minded students are working to make entrepreneurship more than a niche. “There are very few professions in the world that are more liberal-artsy than being a young entrepreneur,” says ASPC President Darrell Jones III ’14, who is already on his second entrepreneurial effort. He is part of a campus group called Pomona Ventures that encourages entrepreneurship and, with support from alumni, helps students line up seed money to get started. But whether a startup is taking off in Claremont, the Big Apple or on a windswept Alaskan island, the shift from dorm-room dreams to a successful enterprise requires stamina, passion—and capital. Beginning entrepreneurs need to sort out their roles within their new organization, find ways to handle disagreements and figure out ways to support each other, all while bringing in the funds to keep the lights on. 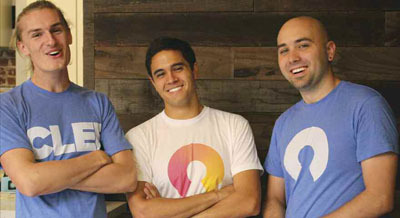 Jesse Pollak, Mark Hudnall and Brennen Byrne. “The habit we keep having to break ourselves from is assuming that there are rules or guidelines or some path to follow. In school, there’s a path that’s laid out for you from matriculation to graduation. Starting a company isn’t nearly as straightforward,” says Brennen Byrne ’12, CEO of Clef. 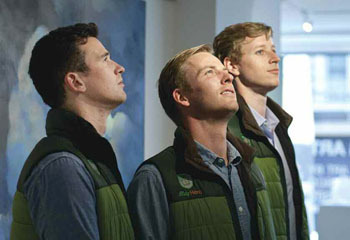 Now based in the Bay Area, Byrne began working with Mark Hudnall ’13 and Jesse Pollak ’15 while they were at Pomona. They started off interested in how websites share information with each other, and ways to improve that process. Within weeks, though, they focused in on the issue of identifiers and concluded that “passwords were the problem.” That led to Clef, a mobile app that replaces online usernames and passwords. The app identifies users by their phones, so they never need to remember or type anything when they log into a site. One area where the startup has tried many avenues is in marketing. They first followed typical routes, trying to get the market, consumers and press to pay attention through social media. But the Clef crew got real traction when they tried something different. This July, they recruited 15 other similar identity companies, a handful of consumer rights groups and a few celebrities to launch a “Petition Against Passwords.” Their move on the petition landed them attention from The Economist, the BBC, Los Angeles Times and others. “We were suddenly a dominant voice in a conversation that we hadn’t had access to before, and we started getting emails from our dream customers asking for more information about Clef and how they could start using it. By stepping outside of the expected checklist, we were able to have a much bigger impact,” says Byrne. Next step: Byrne and Co. are looking to apply their work in the realm of e-commerce checkout, which holds more competition, Byrne says, but also more lucrative opportunities. “Every day there are a million different opportunities for us to be pursuing or directions for us to be going in, and we have to navigate that in a completely different way. College throws hard problems at you, but in a startup you have to find the right problems to solve,” says Byrne, an English and computer science major. Tom Vladeck, Ben Cooper and Geoff Lewis. The company started in San Francisco pursuing the niche of installing LED lighting in businesses such as boutiques, art galleries and hotels. Their pitch: energy-efficient lighting saves customers’ money and benefits the environment without sacrificing aesthetics, and at the start, they were greatly aided by a local utility offering generous rebates for businesses that switched to energy-efficient lighting. “As a small startup, it was hard for us to deal with this type of uncertainty,” says Lewis. So they made a “strategic decision” to expand into New York City, which, like San Francisco, has high population density, lots of small retail shops and high electricity prices, which make LED more appealing. That wasn’t the only shift. With the end of the rebates, the Building Hero crew realized that many small retailers weren’t willing or able to pony up the up-front costs to switch over to LED. So Building Hero switched over to a different model, in which businesses got their lights right now but repaid the cost over time through a monthly service fee, which included maintenance. With no school calendar full of classes, activities and built-in breaks, startup entrepreneurs must adjust to setting their own schedules. It’s their own willpower that must see a team through product launches, long hours and thorny problems. On the other hand, there’s a temptation to skip sleep and ignore all other parts of life. Many entrepreneurs have this type of mentality at first, believing that a round-the-clock schedule will lead to faster success. But the accompanying stress can lead to greater tension and mistakes. The Melon team found greater work-life balance after working as a startup in residence at a top design firm IDEO (most famous for designing the first Apple mouse). There, they learned that innovation comes easiest in a creative space where people are working on a variety of projects. One of their mentors at IDEO advised them to favor curiosity over expertise when hiring, and to designate time every week for creative activities unrelated to Melon. “This is different from college, where you have a pretty set schedule of assignments and deadlines. Learning to create a schedule where we worked efficiently and didn’t overload all the time definitely took a while,” Berman says. It seems to be paying off: Melon has raised nearly $300,000 through Kickstarter, and venture capitalists and angel investors have provided additional funding. The pair, previously based in Massachusetts, was recently honored among 25 top entrepreneurs under 25 by the Boston Globe. 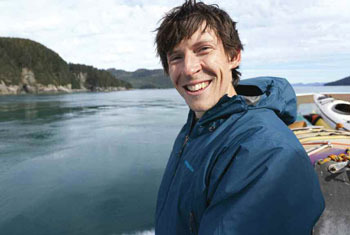 Zach Brown ’07 grew up in the Southeast Alaska town of Gustavus (pop. 350), too small to even have a McDonald’s or a movie theatre, and so remote you can only get there by plane or boat. Perhaps it was the very small town feel that made Brown value kinship and trustworthiness in others. It also made him want to build something in his home state. Brown and three fellow graduate students from Stanford University are founding the Inian Islands Institute, devoted to research and experiential education on a breathtaking five-acre parcel, set on a pristine island and known locally as the Hobbit Hole. The opportunity arose when Brown family friends, who have owned the isolated spot for decades, decided to put it up for sale. As Brown and his partners envision it, the school will bring students from various universities to Alaska for field courses focused on ecology. Participating students will have an opportunity to catch their own salmon, drink rainwater and harvest their own food in a breathtaking setting of glaciers, fjords and temperate rain forest. 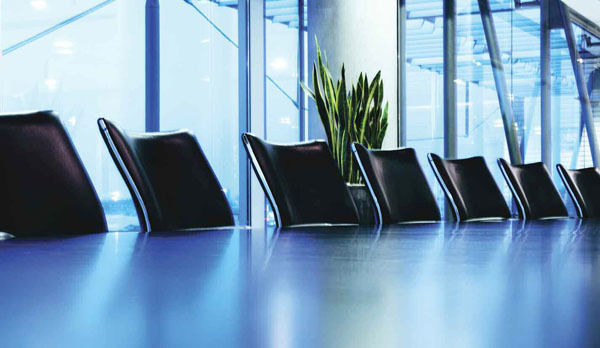 The institute is nonprofit, but many of the challenges, trials and triumphs of a new business startup may apply to their organization as well. To figure out their roles, Brown says his team fell into categories of expertise pretty naturally: “We had one person most interested in marine issues (myself), one most interested in terrestrial issues, one for management/governance and one for conservation. Even though constant harmony might seem appealing, Clef founder Byrne points out that it’s actually a good thing to not always agree. Even though they decided to end that business, neither Lewis nor Vladeck expects this will be their last startup. They want to learn from their mistakes and press ahead. “This wasn’t our last chance to change the world,” says Lewis. “This was just our first chance.” — Mark Kendall contributed to this story.